Bernhard Luginbühl (1929 – 2011) is one of Switzerland‘s most respected contemporary artists. The new exhibition at von Bartha explores his collaborations with fellow artists Dieter Roth, Jean Tinguely and Alfred Hofkunst. Bernhard Luginbühl (1929 – 2011) is one of Switzerland‘s most respected contemporary artists. The new exhibition of his work at von Bartha features Luginbühl’s sculptures, ranging in size from the larger than life to rarer smaller wall pieces. The show also explores Luginbühl‘s sculptural collaborations with fellow artists Dieter Roth, Jean Tinguely and Alfred Hofkunst. Luginbühl’s work is renowned for its ten­sion between move­ment and counter-movement, between dynamic ele­ments mov­ing into space and sup­port­ing struc­tures con­trol­ling these movements. Schuh (1979-94) and Haus (1976-94), which both feature in the von Bartha show, were created as collaborations between the artist, Dieter Roth and Björn Roth. The sculptures bring together Luginbühl’s preferred materials of iron and wood with Roth’s practice of using found objects, including paintbrushes, paint tins, cardboard boxes and an animal skull. Luginbühl and his collaborators’ works fill the gallery with their kinetic, haphazard energy, creating a sense of spontaneity and playfulness. The exhibition also conveys the ambitions of the artists who enjoyed working outside of the studio, creating gigantic sculptures to sit within the natural landscape. 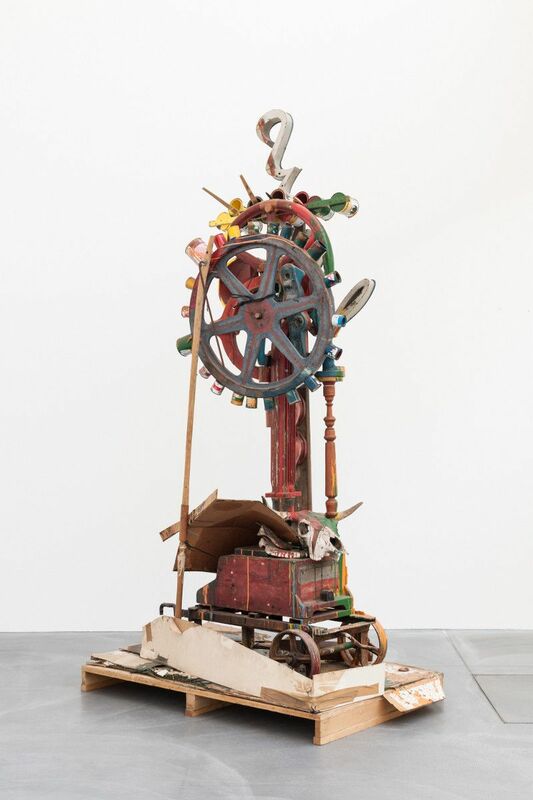 Luginbühl and Tinguely for example, led a group of various artists to create the monumental Le Cyclop in the woods of Milly-la-Forêt (1969 - 1994), and Luginbühl opened a sculpture park in the land around his home featuring his mammoth works in 1998.